Do you know your 12-second marketing message? Have you heard the expression, “First impressions are everything?” Well, this is especially true for Realtors. A bad first impression can turn off otherwise hot prospects, ignite negative word of mouth, and minimize your chances of getting referrals and repeat business. In this post, I’ll outline four surefire ways to make an exceptional first impression and start off all your new relationships in the best way possible. A 12-second marketing message is a short summary (about 10 to 20 words) of what differentiates you from other agents. 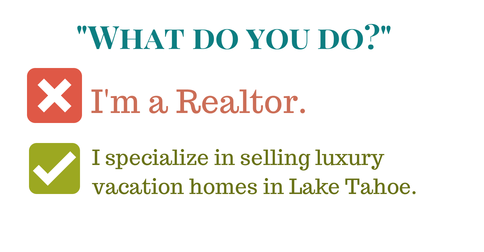 If you meet someone for the first time and simply say that you’re a Realtor when asked what you do for a living, you’re missing a valuable chance to leave a lasting impression. As you can see, the statements above leave a much more enduring impression than saying, “I’m a real estate agent with Better Homes and Gardens.” Good 12-second marketing messages serve to get people thinking about who they know that can benefit from your services (if not themselves). As soon as you meet a new lead, be sure to add them to your Realtor CRM (customer relationship management) platform and put them on a drip marketing campaign or your e-newsletter distribution list. This way, you can make certain that you stay in touch over time. Don’t cross your feet. Instead, keep them on the floor and lean slightly forward. This demonstrates that you’re taking your interaction with the other person seriously and that you’re focused on the conversation — and them. Smile! This helps you show personality and leave a good impression when someone thinks back about you. Smile when you meet someone, during the conversation (if appropriate), and at the end before leaving. You want to avoid smiling immediately after someone asks you a question though, as this can come off as condescending. Be sure to make eye contact with someone while shaking their hand and maintain eye contact throughout the conversation. This shows you’re listening and helps you build rapport. If you are taking notes with a notepad, the person on the other end will feel more comfortable and trusting if you don’t try to hide your notes. Fast response time is critical for leaving a positive first impression and can be the deciding factor in whether your leads convert into clients. Responding quickly shows that you’re professional, motivated and organized. Conversely, Realtors slow to respond come across as disinterested, unmotivated and too busy to handle new business. 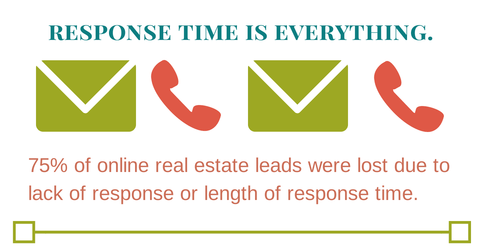 PCMS Consulting and One Cavo found that over almost 75% of real estate leads generated online were lost due to agents either not responding or responding too late (an average of eight hours after the lead gen form was submitted). To ensure fast response times, all your online leads — regardless of where they’re coming from on the Web — should automatically flow into your real estate CRM and be assigned to a drip marketing campaign or autoresponder email. The moment a new lead comes through, your CRM will send you an email alert and the lead will automatically get an email from you as well. As soon as you can, you’ll also want to give the new lead a call. Being late, or worse, missing important appointments or commitments is one of the best ways to stay memorable — in a negative way. This also relates to the importance of keeping your word; if you say you’ll return a phone call, send an email or do something by a certain time, make sure you do it. Many Realtors are late or miss commitments because they have a hard time keeping their business under control and staying organized. So it’s important to be sure you’re using a good real estate contact management software to manage your schedule and entire business in one place and then get automatic reminders via email when appointments or key tasks arise that require your attention. When it comes to positive and lasting first impressions, there are a number of pointers you should keep in mind. You may not have realized the impact things like body language or having a strong marketing message can play in influencing how others perceive you. In any sales role, but especially real estate sales, impressions matter — a lot — and can have a big impact on your success both now and down the road. Matthew Collis is the marketing manager at IXACT Contact, a real estate contact management and marketing system that helps Realtors keep in touch with past clients, and stay organized and in control.